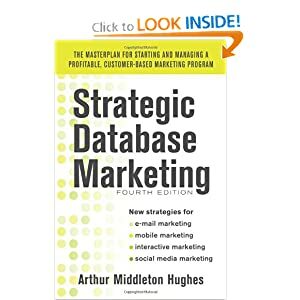 Most successful database marketers outsource the construction of their database. Why? Because it is cheaper and faster, and the product is better. To use a ridiculous example: It would be possible to go to auto parts suppliers and assemble a company truck from spare parts. Since no one in the company has ever done this before, it would take a year or more, be quite expensive, and would certainly not perform as well as a production model bought from GM, Ford, or Chrysler. But as an advantage, your staff would now know how to build a truck from spare parts. The problem with this approach is that most companies are not in the truck manufacturing business. They are in some other line of work. Building a truck would be a costly diversion from their core business. And, during that year, the company could not use the truck to make deliveries. The same principle applies to building a marketing database from spare parts. No one in most companies (including the IT department) has done this before. It takes a long time, since there is a learning curve associated with each process. It takes time to study the available software packages (there are scores of them) and to install and learn to use the ones chosen. When the database is finished, it will not work as well as one built by some experienced service bureau that has already built dozens of them, and has a trained technical staff whose only work is building and maintaining marketing databases. Finally, you cannot get any benefit from the home grown database during the year or more needed to build it. You get the benefit only after it is up and running. Once your database is up and running, it can be migrated to in-house maintenance at any time. However, if the database is built correctly, your marketers will be so happy with the results of using it, that they will forget about wanting to maintain it. When you are driving a new BMW down the interstate at 75 mph, who wants to stop and become a garage mechanic? What some companies have done. Many companies believe that they have to build their marketing database in-house on their own mainframe. Some have been successful. Kraft General Foods, for example, built their huge customer base on their internal mainframe. The majority of large corporations, however, have outsourced their customer database, and even Kraft finally realized their mistake, and turned to outsourcing. Why is that? Few company computer systems are built for marketing. They exist for payroll, inventory, billing, or manufacturing. These operations pay the bills, and control the data processing priorities of the company. Marketing must sit in the dugout when these heavy hitters step up to the plate. Marketers will soon find that they cannot get the priority attention to their functions that they need to do their job. In-house MIS staffs seldom have the specialized software and experience needed to do database marketing. Merge/Purge, geocoding, statistical modeling, on-line access, ad-hoc counting and selecting are a few of the skills that are needed for database marketing, and seldom available on in-house company computers. Most computer operations, like payroll or inventory, are stable systems that run for years without change. Marketing is dynamic. The software requires constant testing, modification, retesting, and shifts in approach. MIS will not understand having to devote hundreds of hours of program development time on a monthly basis to your marketing database. “Why can’t you guys make up your mind?” is the MIS refrain. As a result, it will take you much longer to get your database up and running, and cost you much more to build your system in-house. The solution, of course, is to find an external experienced service bureau to build your marketing database. If you get the right one, they will have built databases for many others, and can bring a wealth of experience to the table. Develop a tight contract that puts you, as the marketer, in control. You will be able to specify and hold your contractor to timetables and quality standards that you could never do with your in-house MIS staff. Once your database is successfully built and running, it can always be migrated to your in-house computer. But in the crucial formative years, you cannot afford to rely on a part-time pick-up job done by an inexperienced in-house crew. The marketing staff of a large telephone company wanted to build a database of its one million yellow page advertisers. The plan was to have the database up and running in 6 months so that they could use it as a lead generating and tracking system for their sales force. The marketing staff received funding approval for a pilot test of the idea. The database was built by an outside service bureau in a three month period. It enabled the marketers, for the first time, to know who their most profitable customers were, and to compare the level of advertising by different industrial classifications. It worked and provided the marketing staff with exactly what they wanted. The next step was a long term contract to keep the database updated on a monthly basis using a tape from the MIS billing file as the key input. Seeing a reduction in their key role in the company, the in-house MIS group said they could build such a database themselves, and what’s more, do it cheaper. The external contract was canceled. To build the database in-house, MIS had to install new and unfamiliar database software, new merge/purge software, and postal pre-sort software. They had to create a new on-line access system so that users could work directly with the database. Millions of dollars were spent on acquiring this new software and learning how to use it. The work went slowly, because MIS had many other more high-priority projects which took programmer time and funding away from the marketing database. Four years later the database had not been built. The key individuals in the marketing staff who had initiated the program had left the company. The project was canceled. This experience is not at all unique. Contrast this story with the database experience of companies like Microsoft, Pizza Hut, Western Union, or Nestle. All of them have large data centers, yet they have elected to have their marketing databases built and maintained at outside database service bureaus.